United Nations (United States) (AFP) - Russia and China joined Cuba, Iran, North Korea and several other countries at the United Nations on Thursday to show support for Venezuela's President Nicolas Maduro in his showdown with the United States. Venezuelan Foreign Minister Jorge Arreaza told reporters the newly-formed support group would take action in the coming days "to raise awareness around the dangers that our people currently face." "We all have the right to live without the threat of use of force and without application of illegal coercive unilateral measures," Arreaza told journalists, flanked by the ambassadors of several countries. Among those at Arreaza's side were envoys from Russia, China, Iran, Cuba, Nicaragua, Bolivia, North Korea, Syria along with the Palestinian representative and diplomats from Caribbean countries. Diplomats said about 50 countries had joined the group in support of Maduro's government. The 193-nation United Nations has been divided between countries that support Juan Guaido, who declared himself interim president on January 23, and those who back Maduro. 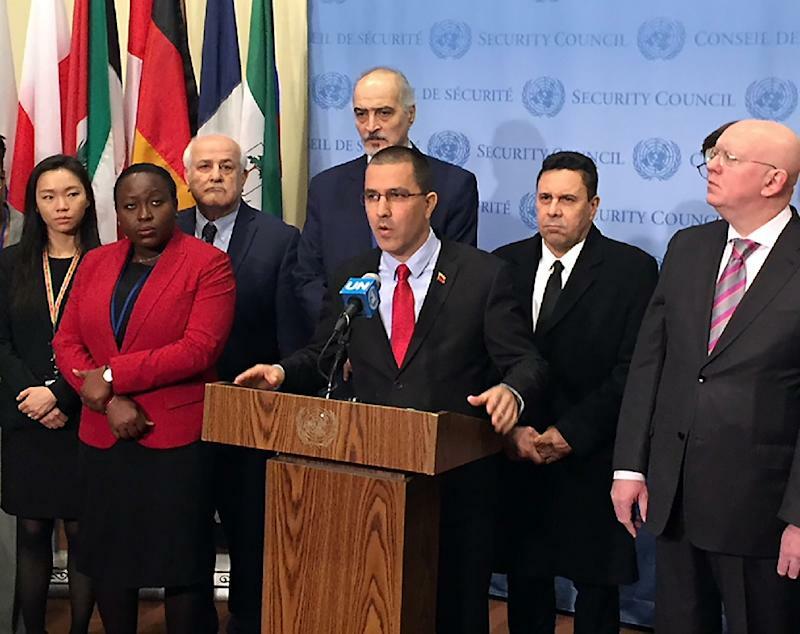 Arreaza did not provide details of the planned action but called on all UN nations to "join us in defending international law as the only guarantor for humanity's peaceful coexistence." Russian Ambassador Vassily Nebenzia told reporters that Venezuela was planning an international conference to show "support (for) the legal government of Venezuela." "We are very much concerned that some hotheads may be considering a military action," said Nebenzia. Washington has sent aid to the Colombian border with Venezuela but Maduro's government has refused to let in the shipments, accusing the United States of using the relief packages as a political tool aimed at regime change. Declaring himself "sad" about the "turmoil" in Venezuela, President Donald Trump on Wednesday demanded that Maduro unblock US aid shipments and has refused to rule out military action. Guaido has said the aid blocked at the border would be brought into the country on February 23. Caracas maintains that US sanctions are to blame for the economic meltdown that has driven some 2.3 million Venezuelans across borders, according to UN figures.